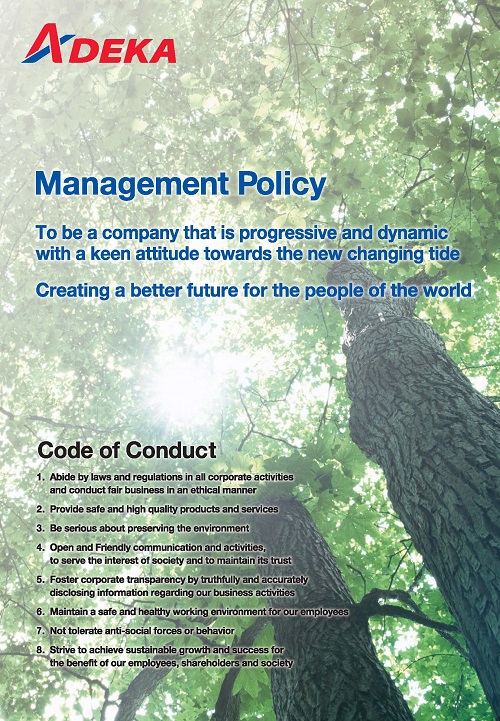 Our Group is developing a global network of business by focusing on our highly competitive and technologically superior product groups in the world market withthe management policies: "To be a company that is progressive and dynamic with a keen attitude towards the new changing tide" and "Creating a better future for the people of the world." While focusing on growing markets with unique excellent technology, we are striving for the leader in the specific market categories where our group is strongly competitive and contributing to promoting global welfare by providing the marketwith products of state-of-the-art and products truly responding to needs of ourcustomers. We abide by domestic and overseas laws and regulations as well as corporate internal rules and conduct fair and transparent business in accordance with social ethics. We develop and provide products and services that truly contribute to the construction of a sound and wealthy society. We provide products and services of safety and high quality, giving first priority to customers’ satisfaction and reassurance. We acknowledge that voluntary initiatives to the environmental efforts are essential for existence and activities of enterprise. We give special consideration to preservation of the environment by endeavoring to develop and provide environmentally friendly products intended for easy recycling, and aggressively tackling conservation of resources, including energy and waste minimization. We want to be a business enjoying broad and deep-seated trust from the public by emphasizing the dialogue with it. We highly esteem traditional culture and practices not only in Japan, but also in the countries where we are located, and make best efforts to contribute to the development of communities in various aspects, by participating in community activities, disaster relief services and other volunteerism. We disclose business information that is useful for society in a timely and appropriate manner. We fully acknowledge the key relevance of protection of confidential information, including privacy of customers, and deal with such confidential information as customers data stored with us in accordance with the provisions of our house rules, in an appropriate and rigorous way. We secure a safe and healthy working environment for employees, respect their human rights, give them impartial and equal treatment, and realize their comfortable and wealthy life. This attitude builds a vibrant company that appreciates their uniqueness and initiatives. We totally exclude relationships with any anti-social forces and groups which jeopardize order and security in civil society and put undue pressure on business activities. We reject their unreasonable demands aggressively. We seek harmonization as well as co-existence and co-prosperity with civil society, and strive for sound and vital development and an increase of profitability. We aim to do this through fair and transparent management and global and innovative business activities, thereby realizing an appropriate return of our results to society.